If this is the end of the series, I am going to shoot myself. If that next book doesn't come soon, Jennifer L. Armentrout will be getting a LOT of hate mail, from me and all my friends. Probably also from all the other people who have read this series too. Because come on, how can Daemon and Katy, after all they've been through, now be in the same situation that Beth and Dawson were in, like, 20 minutes before? I'm still upset about it. It took a few moments for it to sink in that the book was actually OVER and Daemon and Katy were separated by that blue laser thingy, and Katy was now trapped by the Arum and the DOD. When it did sink in though, I think I was ready to bawl my eyes out. 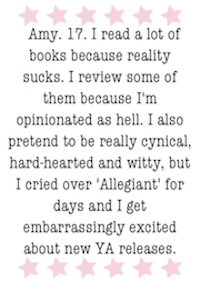 And I don't cry in books or movies. Like, ever. I actually had to shut my Kindle and get as far away from it as possible, then curl my self into a foetal position and attempt to think happy thoughts just to clear my head and remind myself that, actually, they are just characters in a book. It didn't help much, though. I am still in a fowl mood, and have been unable to read anything at all, almost three days after I finished Opal. On the whole though, I think this book was my favourite in the whole series. There are no words to describe it. Exciting is an understatement; I literally had to force myself to put it down to eat and sleep, and do other things essential for living. I also think that Armentrout's writing technique has progressed incredibly throughout the series, she managed to make me feel as though I had climbed inside the book and was watching it unfold before my eyes. I always love it when an author manages to make me forget the real world and become so entangled in the storyline that I actually get startled when I glance up from my book and realise that I'm not actually in that special alternate universe that he or she has created. That next book honestly cannot come quick enough. I am worried that I will be unable to finish another book without reading the conclusion to this series, and I fear that that will negatively impact my mental health and turn me into some crazy psychopath. And that would be totally awful, because I doubt they let you read the Lux series in Juvenile Prison, especially if it's the reason you became psycho in the first place.